Can you guess what has been on our minds lately? 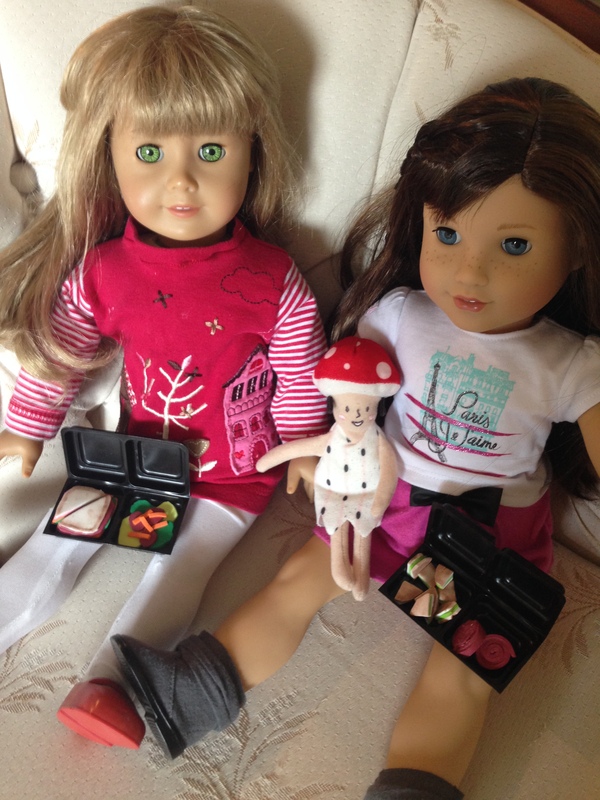 I thought that I would kick off the end of summer with a post about back to school lunches for dolls. Actually doll food has been a hugely popular craft for us this summer, but more on that later. Here we have a very simple, but fun craft that anyone can do. All you need is some craft foam and a little container to keep your doll’s lunch in. We used some pieces from a chocolate box liner. Yum! I didn’t mind eating all of those chocolates to free up the box for crafting! LOL. The first thing you do is cut your chocolate box liner to size. It makes a perfect little cafeteria lunchable box for the dolls, don’t you think? Now for the fun part. What does your doll like to eat in her lunch? Ours like sandwiches. And fruit roll ups! 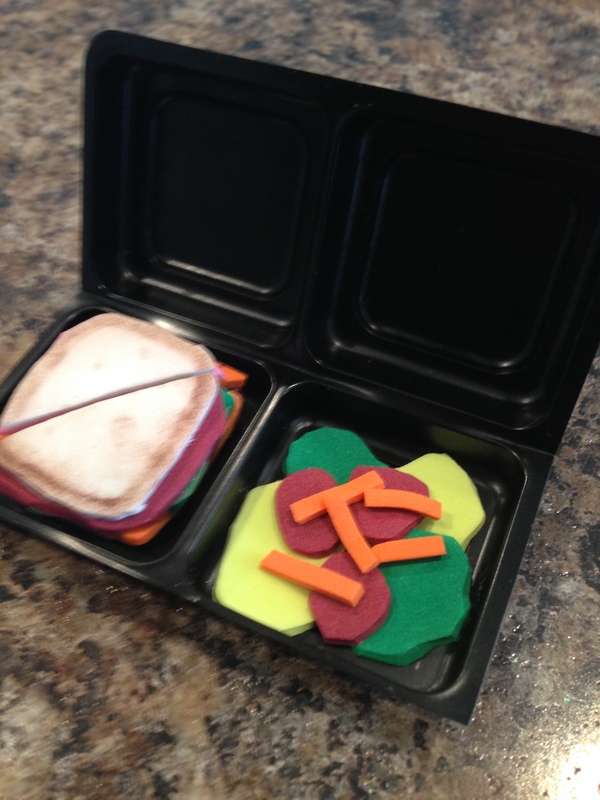 Using pieces cut from different coloured craft foam, go ahead and build your sandwich. You can put in as many fillings as you like. Then just glue it all together. We used white foam on the top and the bottom for the bread. Then we added some brown marker around the edges, and just smudged it a little to make it look like crusts. Cut your sandwich in half, or in many bite sized pieces. My seven year old made the bite sized sandwich with the roll ups. It’s not as healthy as my side salad, but according to my daughter, it gets points for being a lot more fun. 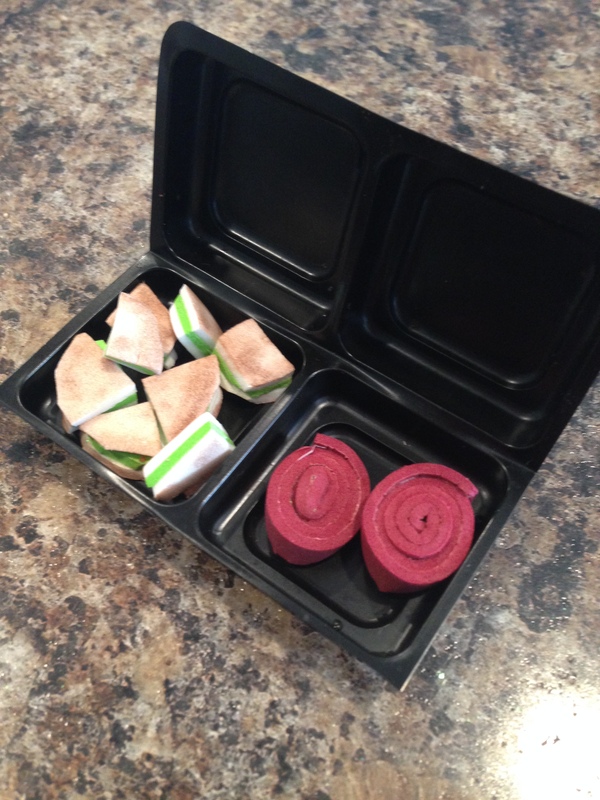 Back to school is right around the corner, so go ahead, make your doll a cute lunchable. Grace: What do you have in your lunch, Becky? Becky: Salad again? (groan) I wish I had fruit roll ups in my lunch like you, Grace. Grace: Here, you can have one of mine. Becky: Really? Oh gee, thanks! Stay tuned for many more doll food tutorials as our obsession continues! < Previous A DOLL PIZZA PARTY!